Dr. Erin Oksol is a Psychologist and Business Success Coach, who in the span of a few short years found herself as the owner of two successful businesses, went from overweight and unhealthy to competing and placing in several fitness competitions and she even became a fitness model at the age of 40! She started like most of us… after earning the highest academic degree, she ventured off to simultaneously start a business as a psychologist and create a family. Juggling work while raising babies was no small feat and soon she started feeling uninspired, exhausted, clinically depressed and on top of that had to work 50-60 hours just to pay the bills. That’s when she had reached her “emotional rock bottom”. From there she started asking herself “What is it that you truly want to do with your life and WHY?”, that is when she started getting answers and changing her approach to life and how she handles her business. She learned how to work smarter, not harder. Nowadays, Dr. Erin is on a mission to help others get on their mission! She works with entrepreneurs and business owners to help them clear the road map of where they are going and end each day with a sense of satisfaction for taking action toward getting there! This is what AMPed! is all about, together with Dr. Erin we can improve your mindset – and improve your bottom line! For the very first episode of Amped! Supercharge Your Success with Dr. Erin she is featuring Rhonda Liebig where they talk about how to Revitalize Your Energy: Play at a High Level Without the High Fatigue. Rhonda's expertise revolves around running two businesses that cater to the health and wellness area. She is also a health coach, energy revitalizer; mindset mentor. What are the signs that you have fallen into fatigue? How can you play at a high level in their business and stay connected with themselves so they don't hit fatigue? Rhonda is fiercely committed to supporting busy leaders that are exhausted and ready to revitalize their body and mind to be unstoppable in their business and life. Over 15 years in the health industry Rhonda specializes in breaking through energy road blocks by using her “ROAR Your Way To Revitlized Energy”, a six step strategy that creates your day with tenacious energy. Rhonda will inspire you to face areas of self-limiting beliefs so that you build a momentum to your healthy plan that can be so confusing for many, deep self-care. As a leader she is passionate in what she does and has built her business on a strong foundation as an AADP Certified Health Coach. Author “The FITT Solution”, an international Speaker. You may have also seen Rhonda through the media platform on Fox News, Good Day Sacramento, and other interview circuits. Her Energy ReVitalize Coaching has supported clients located in the US and abroad. How to connect with Rhonda? In today's latest podcast from Amped! with Dr. Erin, she is featuring special guests Mary Cravets who is an International Speaker and a Client Generation Expert. Clients include the former CFO of Microsoft North America, thought leaders in the coaching industry, and rising stars in a variety of other professions, including doctors, lawyers, consultants, graphic designers, and CPAs. #1 bestselling author, sought-after speaker and featured guest on countless radio shows, TV, podcasts, blogs, and tele-summits, professional Architect turned Stay-at-Home Mom, and Founder of YOUR Permission Pinwheel™, thought-leader Pamela Zimmer — known as your “Self-Care Concierge” — teaches professional women how to have peace and balance in their lives through a consistent practice of self-care (which is more than just a monthly massage or mani/pedicure). With a leap of faith, Pamela quit her career of 13 years. What she didn’t anticipate was the 6-year struggle she would face battling severe Postpartum Depression. Out of her pain came her purpose, and the lesson about self-care. Today, Pamela mentors women with her groundbreaking, 5-step permission-based program, offering the structure, foundation and guidance they need to take care of themselves first. Self-care isn’t selfish, it’s essential. - What is self-care; why is it essential? - What's the connection between self-care and productivity? - Why are you so passionate about self-care? - How she got into teaching Self Defense and why is it important to her. - Her approach to personal safety different from what's traditionally thought of as self-defense. - How women's self-defense fits into the current cultural landscape? Cynthia was born and raised in Oklahoma but lived for 30 years in Silicon Valley, where she worked in high tech and raised four children. She recently escaped the Valley to return to country living at her new 20-acre ranch, which she shares with her horses, dogs, and cats. Cynthia is a certified Personal Defense Readiness™ coach and 4th-degree black belt. She helps people who feel at-risk and vulnerable learn how to deal with danger, to navigate through fear, and to discover their inborn strengths, power, and skills. She shows them how to not just how to survive, but to thrive in their lives by breaking the shackles of fear and getting into action. - What is Metastatic Disease. - What she found to be helpful and positive in carrying on, despite a diagnosis like terminal cancer. - How has Metastatic disease impacted your life in the layers of families and caregivers, and Faith? Angie was diagnosed with Metastatic breast cancer in June of 2013. Since that date she has had 19 surgeries, 4 years of Chemotherapy, Radiation and major procedures performed on life dependent organs. Was told "clinically" that a less than 12 month prognosis was a best case scenario - and has beaten those odds for almost 6 years. - How to be inspired to get clarity in our lives and the impact that makes. - How do you keep our passion alive day in and day out? - What do you say to someone who tells you they don't have time? She persevered in late 2017 and soared to amazing new heights in 2018, launching an innovative networking business, co-authoring two Amazon Best Sellers, graduating from Dale Carnegie's Skills for Success and Brendon Burchard's High Performance Masters Program. She set out to speak at 20 different engagements and has spoken at 16 to date. While she is grateful for all the amazing milestones she stepped upon this year, she is curious and wonders what more she can do in 2019 to serve and help others discover or reawaken their possibility for greatness. Ly Smith lives in Reno, NV with her husband of 17 years and their 16 year old daughter. She achieved her lifelong dream of being a stay-at-home mom, and after a two-and-a-half year battle with depression, she struggled to find her next pursuit of happiness. - The body's intelligence and how it works. - How can people best learn about their own body intelligence? - And the type of people that can most benefit from this kind of work. Teresa's cutting edge program, Your Life’s Design™, provides participants with insights into the deep-rooted impulses that negatively impede their desires. Heather Burgette has her Bachelor in Professional Writing and Master in Business Administration, both from Taylor University. Over the years, she’s traveled to the Dominican Republic, Ecuador, China, Hong Kong & Taiwan. She grew up in northern Indiana as the oldest of 8 kids, which of course greatly shaped her in many ways. Now she lives in Fort Wayne with her husband of nine and a half years and four kids, ages 7 years old to 2 months old (yes, you read that right). She’s taught college courses as an adjunct faculty member for the past 10 years and her happy places are cooking in a quiet kitchen and watching sunsets because both are peaceful, creative experiences. Craig serves as a Professional Coach, Speaker, and Bestselling Author who specializes in helping women who feel insecure and anxious become fully confident and at ease...no matter what. In this episode with Dr. Erin, Craig talks about anxiety, depression and how 1 in 4 women are taking some form of medication for anxiety or depression or both. Craig will also be sharing about his experience with depression, how he overcame it and learned to thrive in life without medication. As well, Craig will share why he decided to work specifically with women. Having grown up in a family with all sisters, Craig has been an unofficial safe haven for female friends and women throughout the years, all who have gravitated toward him for his unique male perspective, an understanding ear, and profound guidance. Craig holds Master's Degree in Counseling and Educational Psychology as well as his Certifications as a Professional Life Coach through IPEC, (the Institute for Professional Excellence in Coaching), a certified Energy Leadership Master Practitioner through IPEC and a Certified Christian Professional Coach through YKI (Your Kingdom Inheritance) Coaching. Having been born and raised in a third world country, Stella's Eastern European upbringing had her convinced that hard work does not get rewarded as she watched her highly educated, hardworking mom barely get by being a pediatrician for 18 years. Hot water was a rarity for Stella's family, her mom made their clothes, her food came from her grandparents’ farm - grocery shopping and eating out was not affordable. In 2006, Stella along with her mom and sister, came to the U.S. with a broken past, no clear future, and in search of one thing: opportunity. Today, she is blessed to have the ability to create her own vision and turn it into reality. She works hard, that’s a given. She doesn't count the hours that she works, that does not matter. What truly matters is seeing her vision come to reality day by day. Caterina Rando passionately serves entrepreneurs and leaders on a mission. She loves sharing how to build influence and have a massive impact with public speaking events, retreats, and group programs. Her over twenty-five years of educating and empowering groups makes her truly masterful at providing a ton of value. She shows entrepreneurs how to be loud and proud about the value they bring in order to make their businesses thrive. Caterina is all about, positivity, integrity, generosity, community and providing massive value while uplifting others. Caterina is a sought-after-speaker, event producer and a prolific author her books include: Learn to Think Differently, from Watkins Publishing, released in over thirteen countries and several languages, A Women’s Guide To Starting a Giving Circle and her latest book, the ABCs of Public Speaking which quickly hit #1 in four Amazon best-seller categories. Caterina is also, the founder of The Thriving Women in Business Giving Circle. This group of big-hearted entrepreneurs raises money for women and girls education and entrepreneurship training. She wants people to know that they do not have to wait until they are wealthy or retired before they can embrace philanthropy. Temesghen Starr is the best father, believer, friend, and coach. This best selling author of You Are Not Smaller Than the Room, believes that through confidence anything can be achieved. Using this platform to coach others to the achievement of high performance is his mission through coaching sessions and motivation. His background in education, coaching, development, and sales have helped him to maximize and recreate himself over and over again. Kelli Verbosh joins Dr. Erin to discuss the importance of laying strong foundations in your business and why clarity around your brand is a crucial ingredient for success. Kelli loves to help heart-centered entrepreneurs create an aligned brand and business by providing coaching, strategy and implementation support. She also explains why clarity around your brand is a crucial ingredient for success and talks about three non-negotiable key items that are necessary when starting your business. 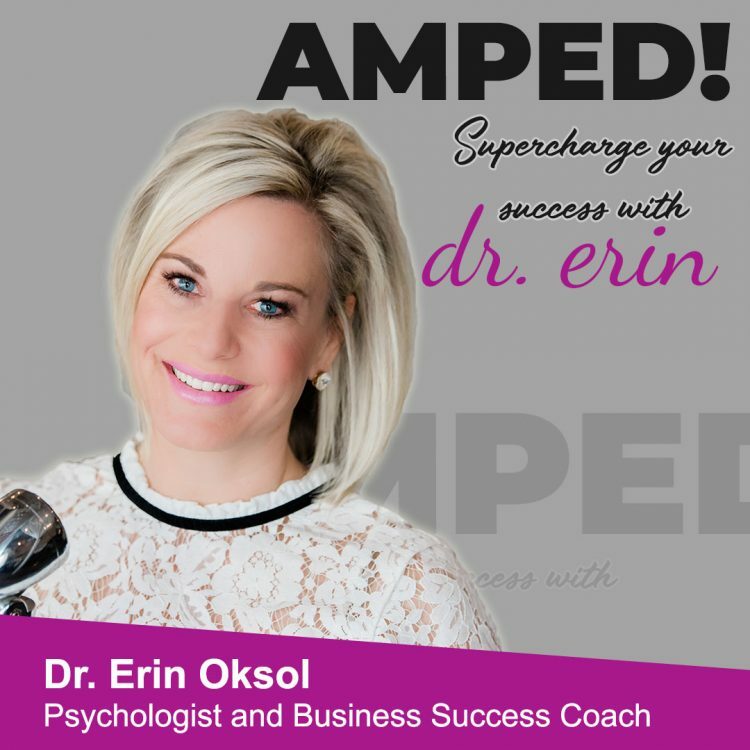 You don't want to miss this episode with Dr. Erin on Amped! Supercharge Your Success.